The tab bar can be positioned at the top or the bottom of the screen; the functionality is independent of its position. It can contain up to 5 tabs, that are equally spaced in the tab bar. … and that tab is highlighted. A tab bar can be used to switch between different modes or views in an application.The user should be able to access all the different modes from everywhere in the application. This means the tab bar is always in the same location in the screen, highlighting which mode is active. 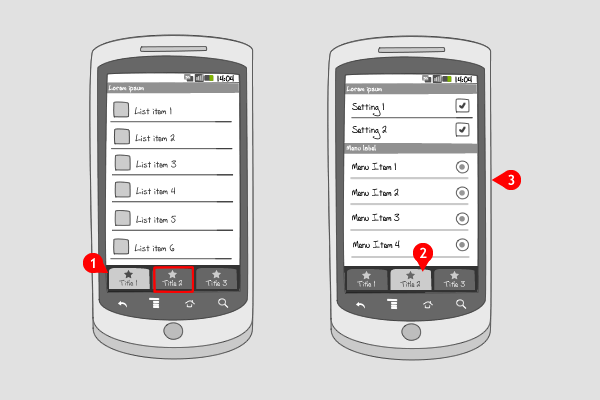 Use the tab bar when your app has clearly defined modes, views or subtasks. If you want to filter a particular set of data, e.g. display favorite items next to all items, use a segmented control. If you have more than 5 options to put in the tab bar, consider placing options in the options menu or in a carousel. You can also add a more-button at the right, which by pressing opens a dialog-menu. If you need all screen real estate for your content, a features dashboard can be used to provide similar navigation. The tab bar should not contain buttons to perform actions on elements in the current mode. For that a toolbar is useful. Takes up more screen estate than placing navigation items in the Options menu. 1 Tunewiki, a social media player, uses a tab bar with icons only. The active tab gets highlighted. 1 Engadget displays a tab bar at the bottom with icons and titles. The selected tab gets highlighted. 2 When selecting an other tab, here the video tab, the content changes into video content. 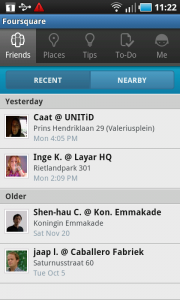 1 Foursquare shows a tab bar at the top of the screen, providing 5 modes. The active tab is highlighted. 2 Tapping on a different tab, shows the corresponding mode. hi, how to set 3rd tab and its contents by default selected when an activity is start? please reply as early as possible. Other ways to let users toggle between different sections or activities?